His Excellency Prime Minister Dr. Haider Al-Abadi has received, in his office today on Monday, NATO Secretary General Jens Stoltenberg and his accompanying delegation. Dr. Haider Al-Abadi has welcomed the guest delegation, confirming the importance of cooperation with NATO to fight terrorism. His Excellency has added that what we achieved it is a triumph victory against Daesh's terrorist's gangs, we must maintain it, eliminating terrorism's ideological and continue to pursue it, indicating that cooperation between Iraq and NATO is important in this field. 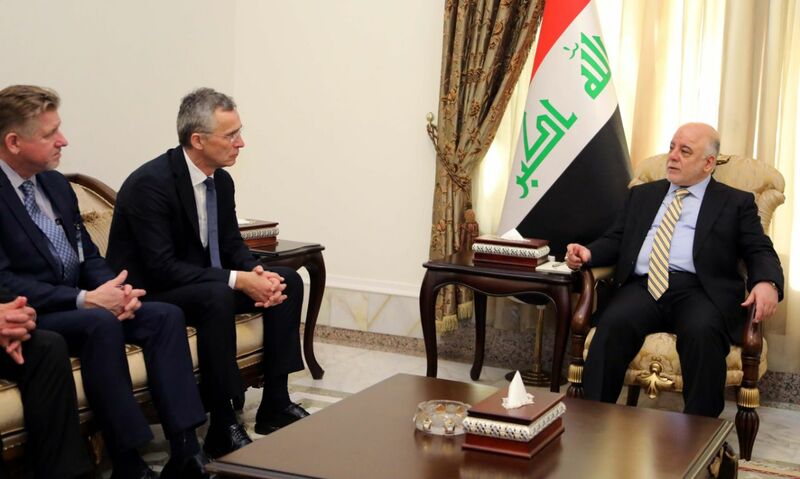 Mr. Stoltenberg said that the meeting with Dr. Haider Al-Abadi was very fruitful, adding that: "We are proud of the Iraqi victory over Daesh and that victory is for the whole world. Mr. Stoltenberg said that we are training Iraqi forces, committing to support Iraq, cooperate with him in training, building military academies and providing expertise. Pointing out that Iraq was on the front lines to fight terrorism and we admire very much for his victories and thank the Iraqis for their sacrifices in the fight against terrorism.